It's big. It's got that Cadillac ride. It rumbles. It has a leopard print dashboard. It looks great on me. And it once got into a drag race with a 1965 Cadillac hearse - on the Las Vegas Strip. Nothin's cooler than a big old Cadillac. May 27, 2008 1:13 p.m.
Classic picture - the perfect setting for that car. May 27, 2008 3:17 p.m.
Gotta vote this one up just for the classic pic. 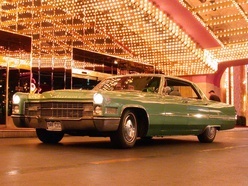 Jun 2, 2008 7:07 p.m.
That picture was taken at the entrance to Circus Circus in Vegas, at around 2 am. It's where old Caddies live. Jul 2, 2008 3:51 p.m. I love it... And the Hunter S. reference on your page dedicated to it. Feb 12, 2009 4:26 p.m.
Aug 20, 2009 2:37 a.m.
Can't..help...myself... MUST...vote...up! Don't post up anymore pics, or I'll have to send you money for gasoline. Sep 24, 2009 8:27 a.m. Perfect setting for the photo! Nov 18, 2009 8:45 p.m.